Do We All Have a Social Destination? French sociologist Henri Lefebvre, believed human interaction could be coined much the same as a simple Sunday walk. Wherever you went, your journey would be wholly dependant on the many ‘social realities’ that intercede your path. Mr. Lefebvre was convinced ‘social realities’ were everywhere. This included the idea of urban planning, the form of architecture, the conversation of language and even the appreciation of art. His research supported how either consciously, or unconsciously, we allow these ‘social realities’ to influence and guide our course of being. Short of it, when building community we are influenced by various social circumstances whether natural, man-made or intellectual. Our simple Sunday walk is anything but. Granted, these traditional ‘surroundings’ have shifted from parks and buildings, to today’s digital ‘social realities’ as Facebook and Google+; as this primal need to belong has no qualms making the jump to cyber space. This does make perfect sense. As social networking sites as Facebook, Google+ are more representative of today’s ‘social realities,’ the ability to arrive at our ‘social space’ is more accessible and immediate. It’s a heck of a lot easier to click and scroll than walk and run. Is There a ‘Social Space’ For All? Has mankind achieved its true ‘social space?’ Has this shift to a cyber landscape affected how we continue our need to belong? Does the immensity of our ‘social space’ impede the ability to share, or does it simply speed it up? Is it true that just as we achieve this magnificent ability to connect, others are still unable to complete this basic human need? Research says, connecting online provides inclusion (circle of friends), affection (loved by these friends – hopefully), and control (over these friends) or the relinquishing there of. These are basic human behaviours for most of us, but what about other human beings that lie outside or reject these basic needs. Let’s look at diversities. Do they embrace social media to enrich their community and feelings of belonging? Sounds about right; being new to a country, you will search for a way to connect that supersedes language and culture. You desperately want to belong in your new country or rejection is soon to come. At the same time, you are able to keep contact with your traditional or existing community. This is pleasing to hear knowing that social media has allowed new citizens to breakaway from more traditional methods of forming community, so they can be more readily accepted and trusted to belong in their new country. Social media marketer Sarah Lee, builds on similar theories in her TedxKalamazoo lecture. 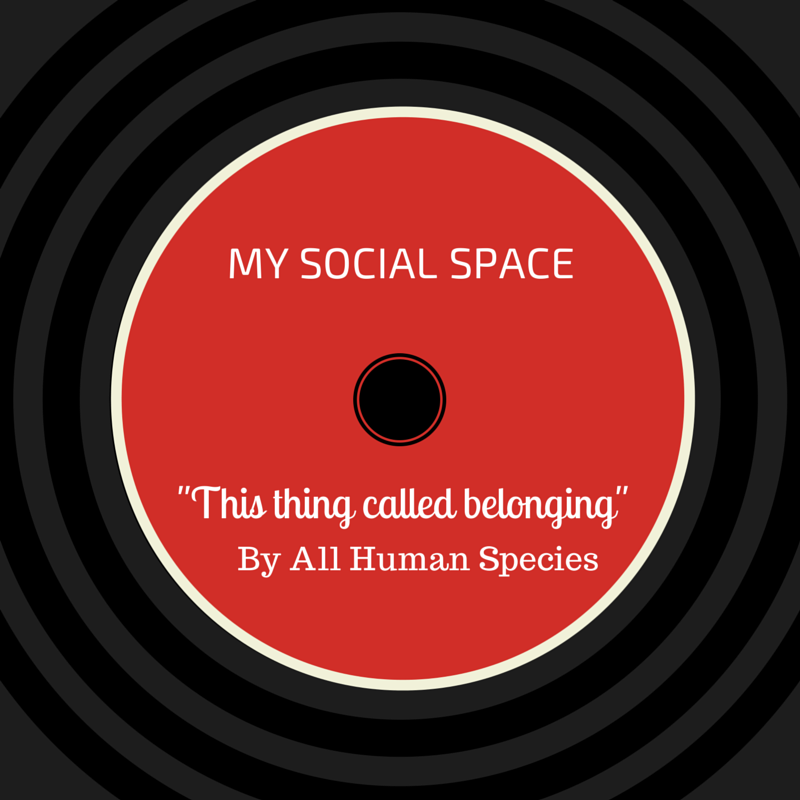 Do All Humans Have the Ability to Belong? The result of connecting and sharing within a public, social, personal or intimate space provides only envy and jealousy and ultimately loneliness for some who seek inclusion and cognition. New Yorker Magazine piece by Maria Konnikova, cites various academic studies underscoring how most of us want to belong in a ‘social space’ but provides a directly opposite result. For some, gravitating to this new ‘social space’ has caused only alienation and despair; absolutely no sense of belonging and community. Allow Social Media To Guide You There. Now that humans have a better understanding of what to look for when charting our ‘social space,’ we can truly embrace and enjoy our journey. We have the ability to navigate the internet’s many ‘social realities’ towards building and experiencing our need to belong, and the community it brings. How music molds our moods and helps provide a common ground to communicate. There has been no better way to spend the last 15-plus years than understanding, creating and delivering communication and stakeholder strategies. Even in my spare time I will read, watch and listen how folks exchange greetings, information and advice. Yes, there are similarities in how we all communicate and yes, each dependant on various factors as language, geography and culture. All said and done, what’s a person to do when faced with multiple communication barriers? Hand gestures are good. A few grunts can help, but you may find yourself becoming perilously close to insulting your host or community partner. Equally, communicators are faced with very little time to deduce cultural and geographical nuances. Let’s look into the research behind music and its ability to communicate followed by my own realization how important this lesson is to all communicators. Face it. We all love music. Either cranked and blaring, or soothingly pastoral, our insatiable measure for melody has helped us along the road of life. We have all experienced moments where music has helped form moods beneficial to lifting us out of depression and offering that extra bit of ‘power’ when cleaning the garage. When our own esteem is not enough to change our disposition, we put in the ear buds and let music work. But hold on, if music is not complex enough, it seems to have the ability to bait more deeper thinking and reflection. What can be more relaxing than unwinding to Sarah Vaughan’s Misty? Yes, her flawless cadence and vocal range reduces our stresses, but if we listen carefully to her lyrics, something deeper is at work. Misty actually tells a story of loneliness and love (soon) to be lost – common themes in jazz music. A few minutes later you find yourself relaxed, but a little gloomy. Is music that powerful to transcend you from relaxation to melancholy? You bet it does! Music directly communicates particular behaviours clearly and succinctly. What is it about music that helps to us communicate without ambiguity? Makes sense and solid rationale for ‘Misty’ sounding sumptuous upon initial listening but teary eye’d by the end. Has the song communicated what it ‘wants to express’ to me? Ujfalussy goes on to state, ‘simultaneous combinations are suitable for erecting the audible, dynamic models of human relations and types of behaviour.’ If I’m hearing him correctly, this means combining music and lyrics are suitable towards building a sound common to particular types of human relationships and behaviours. Each musical piece, whether with lyrics or not, is directly relatable to many moods and behaviours. This research is telling us, music and the emotions it brings with it, effectively represents a common vehicle for communication. So what Mr. Guevara is saying, its hard-wired into all of us through our individual cultures. Back to communications management and stakeholder relations, today, many clients are based within diverse communities and strive to bring a ‘common ground’ in order to communicate what is important to them. Music is indeed a singular platform for exchange between cultures unified by an inherent need to communicate. Looking back over my life, I was taught this many years ago while tramping across the globe. 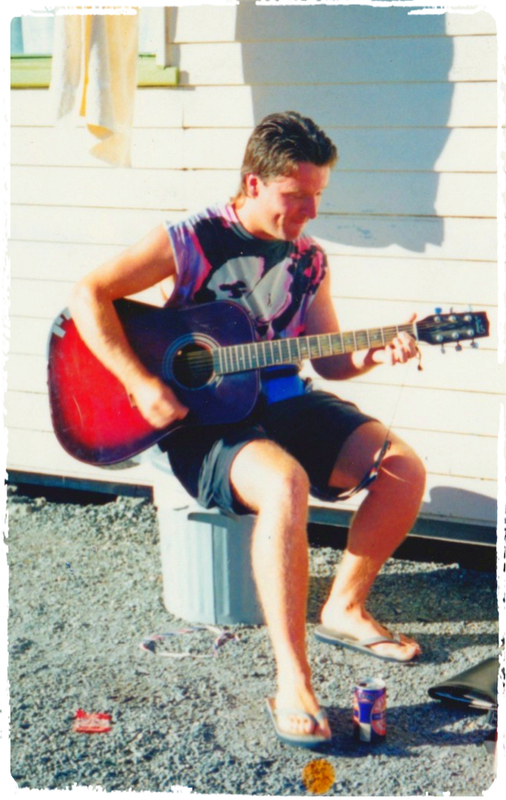 Happy #throwbackthursday and the day I clearly understood the power of music and communication. Before a career in communications, I travelled the world to find amongst other things – good and enriching conversation. Don’t get me wrong, food was the main catalyst for leaving, but I always loved people. Travel offered me the agency to explore and comprehend how people in many countries act and react with each other. It’s 1990, you are young, say pushing mid-thirties; after all being in your mid-thirties equates to mid-twenties – right? It’s Friday morning and you reference your trusty Lonely Planet ‘yellow bible’ for the first stop on the Indonesian leg. Blankly you stare at the pages with little interest as you are exhausted from day after day of laborious backpacking ritual. Lock your goods, eat your provisions (as sure as heck it will be gone within the hour) and stash your money! Minus a few bucks for snacks and beer. Yup, just one ale tonight as your five month journey has barely cusped the two month mark and money is precious. By now you are very familiar with all the different languages being spoken at the backpackers but yearn for a conversation with more than one. An 80 year-old Italian gentleman sits me down at breakfast to inform me, in broken English, ‘You walk five miles a day. You live as long as me!’ Sounds like good advice but others at the table had a hard time with his English and left him half-sentence. As Germans hung out with Germans, and French hung out with French, I felt a little peeved at them for not trying harder to communicate. His story although fragmented was interesting and lead me to trek the Fox Glacier the next day. Then out of the blue there lies a red sun burst no-name 6-string. Duck taped body, worn fret board, mother-of-pearl inlays missing and old – really old – strings. But what the heck, you need a distraction on a long day and you pick it up. Tuning is relative but if you play loud enough who cares. I had just picked up The Smiths’ Meat is Murder cassette tape and really liked the song, ‘That Joke Isn’t Funny Anymore.’ Can’t be that hard to strum on this relic? Thank god for tabs of which my good friend Chris Robinson taught me to use and a couple of G chords later – presto! We’re rocking. Then a very interesting thing happened. People started to gather around to listen, hum and sing. This out of tune guitar mixed with a little chord and lyrical improvisation, had produced genuine language parity. A common ground to communicate. Germans, French, British, Spaniards and Americans joined together and struck down all language barriers with one contemporary song. Some spoke English but all knew the rhymes and rhythms of rock and roll and this popular British band. Music had eclipsed all languages and offered one unified voice. Today when working with communities, more times than I can remember, a song will break an initial language barrier and provide a commonality of interest and enjoyment. This doesn’t mean you have to break out in song, but it’s understanding how we use common elements, as music, to bridge language gaps and provide a clear and resonating voice.